Trainer Steven Asmussen has had plenty of success in his career as has horse owner Ron Winchell and his Winchell Thoroughbreds LLC breeding company, but there hasn’t been a Kentucky Derby winner yet for Asmussen or Winchell. That could change in May as their colt Tapiture is considered among the top Kentucky Derby contenders and closed at 38-1 on the most recent Pool 2 Kentucky Derby odds. Tapiture is out of Tapit, a descendant of Triple Crown winner Seattle Slew, and mare Free Spin. Tapit’s signature victory was in the 2004 Grade 1 Wood Memorial at Aqueduct. That stamped the horse as a Kentucky Derby betting favorite for the ’04 race but he finished a disappointing ninth, with Smarty Jones as the winner. Tapit raced once more, a ninth at the Pennsylvania Derby, before being retired to stud. Tapit also has bred with champion Zenyatta and a foal was born April 1, 2013. Tapiture’s maiden win came in the 1 1/16-mile Grade 2 Kentucky Jockey Club Stakes at Churchill Downs in late November 2013. The chestnut colt, ridden by Ricardo Santana Jr, caught early leader Laddie Boy at the quarter-pole and pulled away for a very impressive 4 1/4-length win. Tapiture returned $8.60 as the second choice on horse racing odds in a field of nine after finishing in 1:43.51 over a fast track. The 6-5 Morning Line favorite in the race, Almost Famous, was scratched just hours before. It was the first career graded stakes win at Churchill Downs for Santana. It was the second career win in the Kentucky Jockey Club Stakes for Asmussen (Private Vow, 2005). The horse’s next start came February 17 of this year when Tapiture was even more impressive with a victory in the Grade 3 Southwest Stakes at Oaklawn Park in his debut as a 3-year-old. Tapiture stayed on the rail and took the lead after six furlongs. He would coast in from there, beating even-money favorite Strong Mandate by 4 1/4 lengths. Tapiture paid $13 in a field of 12. It was sweet revenge for Tapiture as Strong Mandate beat him in a 6-1/2-furlong maiden event at Saratoga in August 2013. 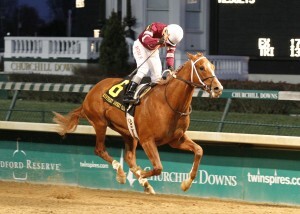 Tapiture’s Kentucky Derby betting odds will shorten significantly following that win. For those who want to bet on the Kentucky Derby, Tapiture took the lead in the standings with 22 total points after the Southwest Stakes. The top 20 points earners get the start in the Derby. In perhaps a nice bit of karma, Tapiture’s birthday is May 3, the day of the 2014 Kentucky Derby. Asmussen plans to keep Tapiture at Oaklawn for his training and is targeting the March 17 Rebel Stakes for his next race, also at 1 1/16 miles. The Rebel is worth 50 points to the winner. Strong Mandate also is likely to run that race.